Not the smoothest move, posting two crock pot chickens back to back, but time’s been in short supply lately and crock pots are super handy. Should be back to some more interesting things soon, but in the meantime, another easy tasty chicken! All those sauces do have gluten-free versions, if that’s relevant to your needs. 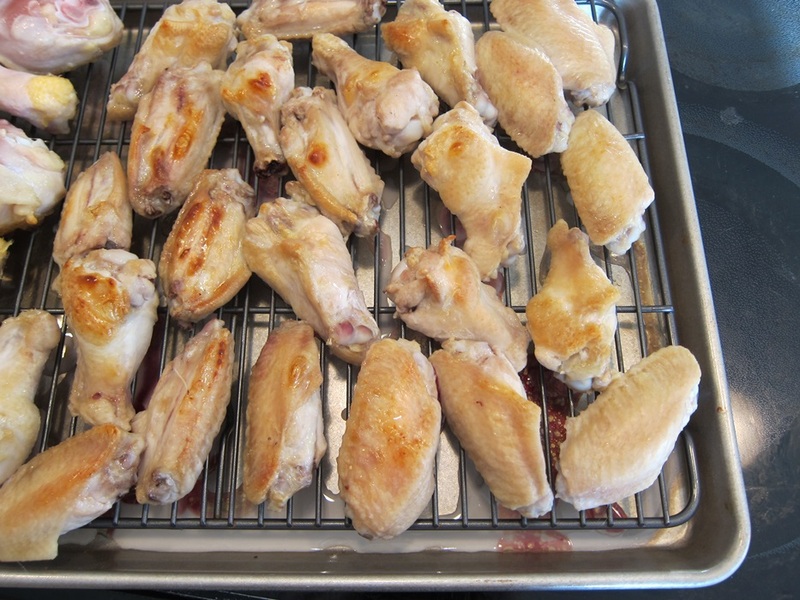 Place all the chicken on a broiling pan or wire rack in a jelly roll so that none of the pieces is on top of another. Broil for 10 minutes on high, flipping the pieces halfway through. If your chicken was, say, not entirely thawed, you might want to broil it a bit longer so that the skin gets a chance to brown up nicely. You don’t need the chicken to be cooked through now, you’re just trying to crisp the skin. Halfway through, some of them are decently browned at this point. 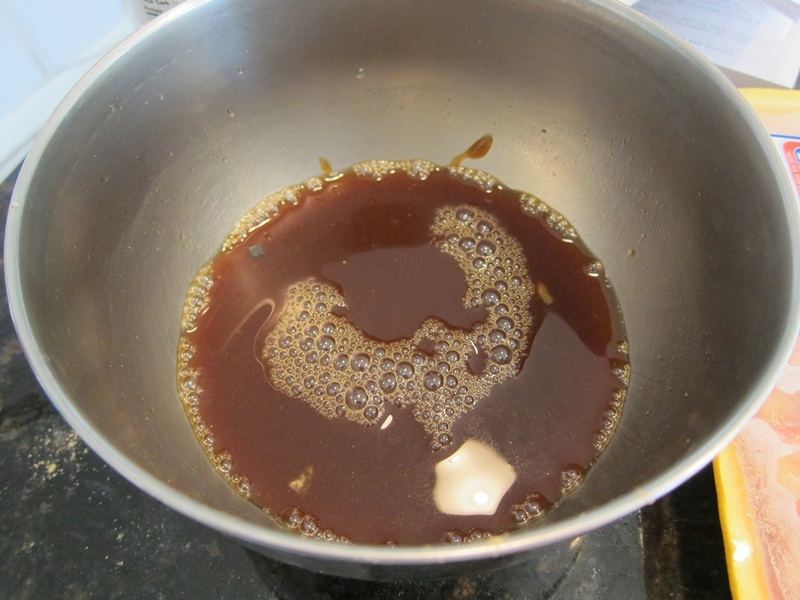 While the chicken broils, stir together the pineapple juice, teriyaki or soy sauce, ginger, and hoisin. 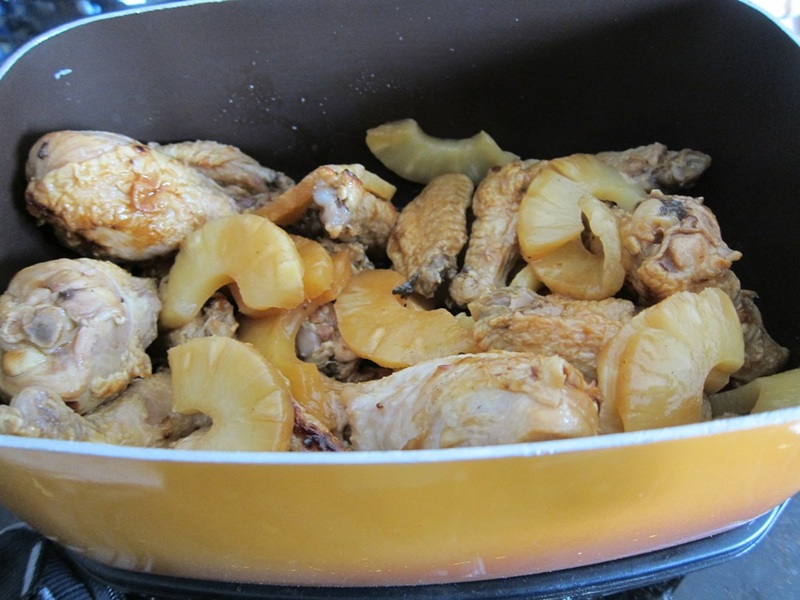 Cut the pineapple slices in half, and combine them, the sauce, and the chicken in your crock pot. Cover, and cook on low for 4-6 hours or on high for 2-3 hours, and it’s ready to eat! While ours cooked, my mom made fried rice. 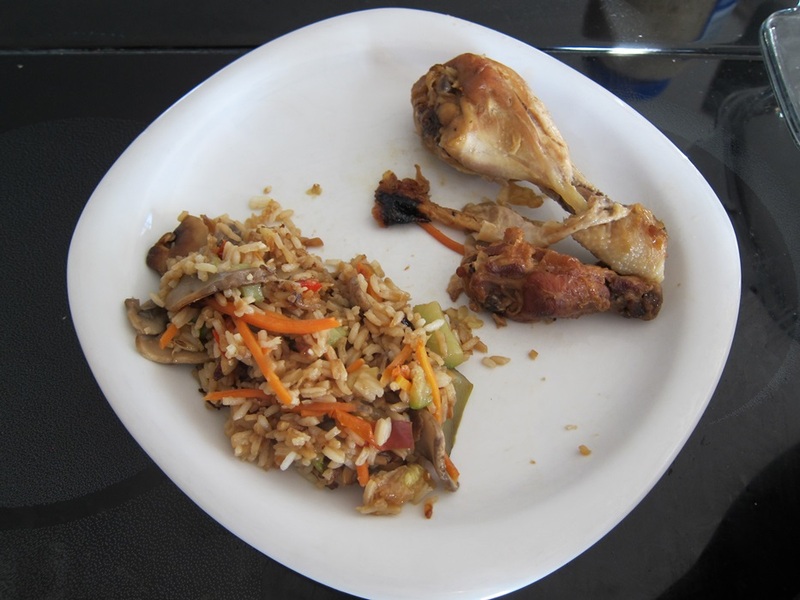 I believe the general process was to cook some white rice, and while that was going, chop more vegetables than this house had even seen used before. 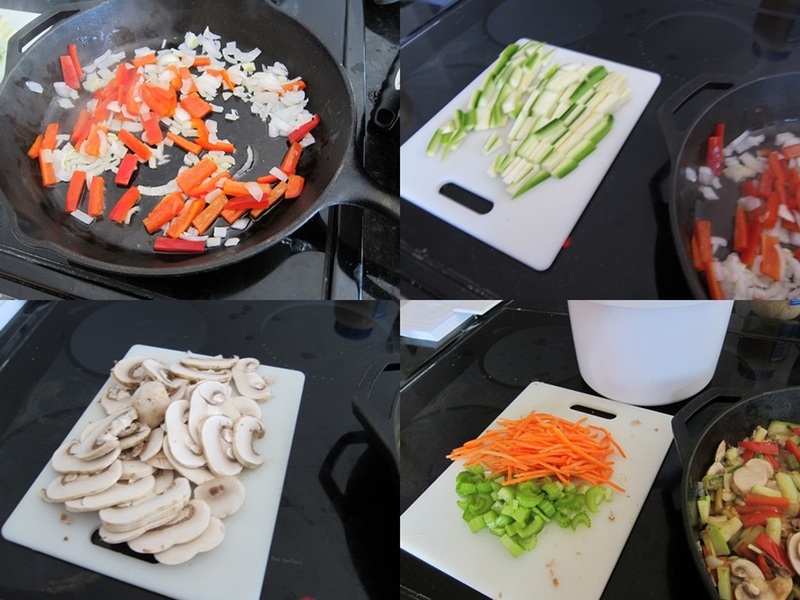 Cook the rice and veggies on the stove with some soy and sesame sauces until the veggies are cooked and things are generally looking tasty. I often add an egg or two to my fried rice. Aaand both finished products. Yum! Pineapple and soy is pretty much always going to be a good flavor combination, and sometimes vegetables are even edible. A fine meal. Place all the chicken on a broiling pan or wire rack in a jelly roll in a single layer. Broil for 10 minutes on high, flipping the pieces halfway through the time. While the chicken broils, stir together the pineapple juice, teriyaki or soy sauce, ginger, and hoisin sauce and pour in the crock pot. Cut the pineapple slices in half and add to the pot. Add the broiled chicken and stir to combine. Cover, and cook on low for 4-6 hours or on high for 2-3 hours. 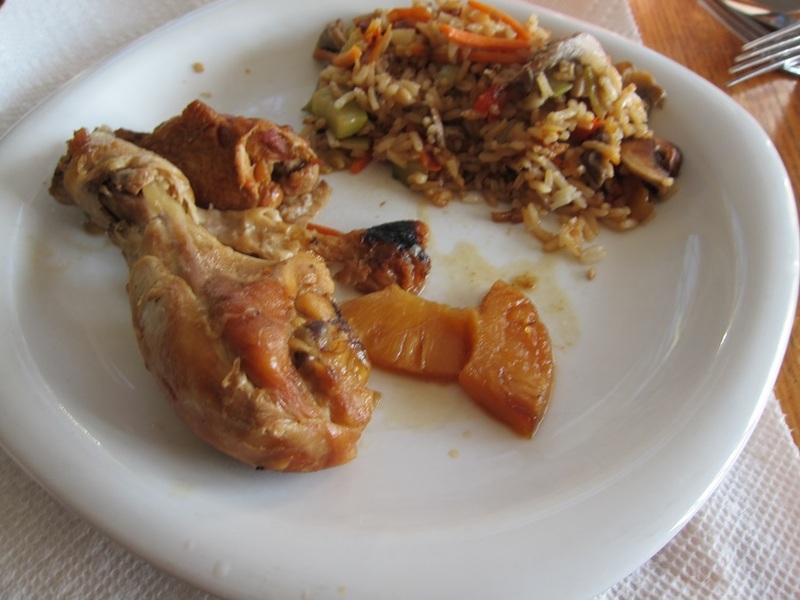 This entry was posted in Dinner and tagged Chicken, crock pot chicken, Pineapple. Bookmark the permalink.